Finally find a way to use Async methods for seeding DB. Thanks! Nope. 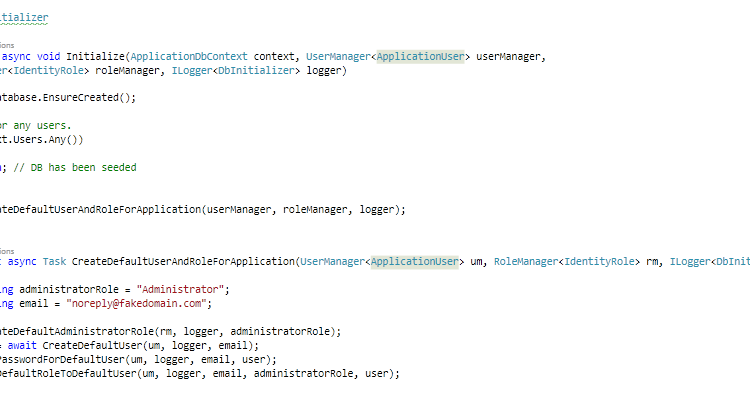 This is not async, and it’s actually a good way to end up deadlocking your application. You should never call Wait(). Here it doesn’t do anything for you, anyways, since whether you block here or with each EF operation, this thread is still blocked. You can either use an async Main (C# 7.1) or you should use ConfigureAwait(false).GetAwaiter().GetResult() (instead of Wait()). This is still blocking, but safer in terms of deadlocking the thread. To be completely safe, you should actually run the async operation via Task.Run. That will use another thread pool thread, but will not block the active thread at all, and won’t deadlock. I found this post very helpful. I wanted to extend it a bit by requiring the application to have a verified Email address before the user can login. I tried to duplicate the code found in the Register method that was created by the Sample app for authentication, however, I am getting stuck. First, I am having trouble getting the CallbackURL. An exception is generated from the URLHelper / Request.Scheme. I never received the Email to confirm the Admin email address. Then, I tried to manually / dynamically generate the individual components of the CallBackURL and successfully made it through without generating an exceptions and received the email confirmation link from the app. Nevertheless, the email link, when launched, generated a null reference exception. If I register a User, the Email link works fine. What would you recommend in my approach to require Email Confirmation from the Database Seeder Process? As you don’t reference the host variable in the initialization code, does it serve a logical purpose to split out the code like that? Nevermind, you can delete my question. I somehow did not notice the use of the host variable in the code! Related though: would the Main() method in Program.cs be be best practive to run the initialization code instead of Startup.cs? You need to use the main method because it is the start of the application. If you need extra services in startup, you can add them here.